Complete with butterfly on its nose, the bear gallops toward the window at Smith Glass. 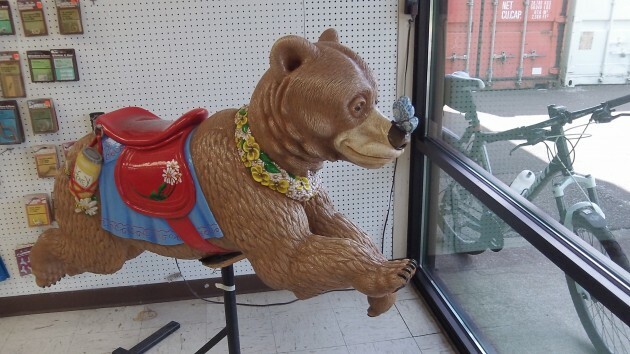 Last Wednesday I reported the vignette of a wooden bear belonging to the Albany Carousel being pushed and pulled along Water Avenue. Now here’s the rest of that little slice of Albany life. As I mentioned last week, I was catching up with the bear platoon on my bike, but by the time I got there they had turned up the driveway to Smith Glass. I wanted to go another way, so I didn’t follow. Well, the company’s Bryan Smith let me know where the bear has found a temporary home. Talent abound! From designers, to carvers and painters! Their work is on display. Now is NOT the time to give up on the ARTS!